Fifteen kilometers north of Rome used to be the ancient (800-450BC) settlement Crustumerium. Archaeologists visit it often to do research. During one of the last visits a tombe was excavated and - using a laser scanner - measured in 3D. The result was a very large data set, which turned out to be impossible to process with the software of the archaeologists. Eventually, the Center for High Performance Computing and visualization was asked to process this data and produce a detailed 3D model. Showing this model in our Reality Cube gives one the feeling to be present in the real crypt. This is also the only way tho see the tomb, because the excavation is now closed up again. Using a Kinect sensor, researchers can control a virtual flashlight as one can see in the video below. 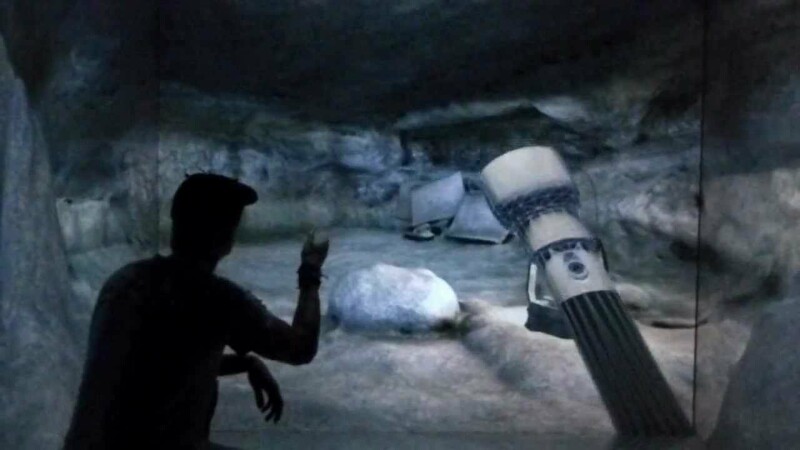 In the video it seems as if the position of the flashlight is way off, but seen from the viewpoint of the researcher, the flashlight appears exactly in the right handposition. More info about the excavations can be found at the website crustumerium.nl. Last modified: 17 October 2017 2.23 p.m.